While pregnant with my first baby I did a lot of research into a hospital birth vs. a home birth. I already knew I wasn’t that comfortable with the hospital option (just watch The Business of Being Born and you’ll see why), but I also had some hesitation about having a baby at home (and my husband was vehemently opposed to that idea). We didn’t realize until we started doing our homework that a third option was available to us: the Birth Center. 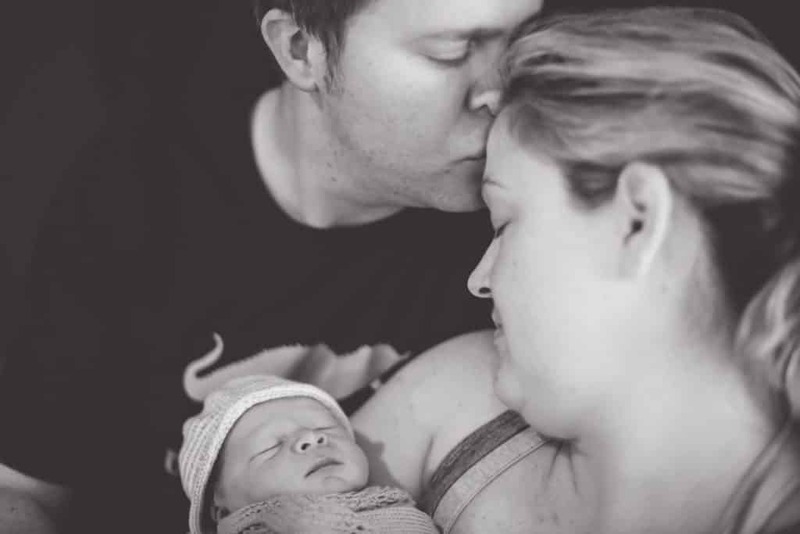 For my husband and me, the birth center was the middle ground we were seeking when it came to where I was going to have our baby. Since I was 100% against the hospital (unless necessary, of course) and he was 100% against our home, when we discovered the birth center, we knew we’d found our solution for a natural, comfortable (as possible . . .I mean, it is labor after all! ), and intervention-free labor and delivery experience. Here are some of the main reasons why I chose to have a birth center birth for each of my babies. In my experience, there is a stark difference in the level of care provided by a midwife versus that of an OB/GYN. In most cases, the OB/GYN is rushed and brief during most of the pre-natal visits. He does the necessary check-up items of each pre-natal visit while answering any questions you may have. The entirety of the visit lasts for maybe 10-15 minutes (after you waited around for your appointment to start for at least 30). At the main event, the OB/GYN often doesn’t even enter the room until you are crowning, so most of the hard work of coaching and supporting you is done by one or two nurses you’ve likely never met in your life. On the other hand, midwives take far more time during your appointment to discuss any and every thing you have questions or concerns about. They also take the time to help you familiarize yourself with your baby and your body as it grows (my midwives helped me feel my baby through my belly to determine whether I was feeling a head or a bottom). During labor, the midwife is by your side the entire time. She is a coach and a mentor and a friend. She guides you through the process and recognizes cues such as changes in breathing and/or moaning to help you understand what is happening to your body when it is happening. The midwife experience is a truly personalized, intimate experience that often turns in to a friendship. There’s also a big difference in the cost of having a baby when you choose a birth center over a hospital. In most cases (and it always depends on whether your insurance will cover a birth center), having a baby at a birth center costs about a third of what it would cost to have a baby in a hospital. I had the unfortunate experience of having to pay for both with my first child since I spent 40 hours laboring at the birth center before I transferred to the hospital where I ended up delivering her. Seeing the difference between the bills from the birth center and those from the hospital was astounding. At a birth center, there is also less pressure to consent to treatments you do not want for you or your soon-to-be-born child (more on this later). During the last weeks of your pregnancy, the midwife will sit down and talk to you about all of the treatments or procedures that are available to you and she will tell you why each treatment is offered and answer any questions you may have about it. With a doctor, it is rare that he would sit down and discuss the pros and cons of these treatments; rather, they tell you what is typically done, all the good reasons for having it done, and encourage you sign the papers for consent. I am the kind of person that needs to know ALL THE THINGS about a subject before I consent to it. I can’t just trust that it’s okay because it’s “the norm.” So being able to go over all the treatment options and have an educated discussion about each of them with my midwife was important to me. Finally, for those moms who have chosen not to vaccinate their children, or those who are still doing their research and haven’t made a firm decision, having a baby in a birth center allows the new family to choose whether or not to allow such interventions such as eye ointment, the vitamin K shot, vaccinations, and the heel prick test to their newborn. In a hospital, certain of these interventions are required by law and the others are very strongly encouraged, whether the parents have had the chance to educate themselves on them or not. Anyone who has ever visited or been admitted to the hospital knows how uncomfortable they can be. The beds are small and lumpy, there are nurses going in and out of the room constantly, you usually end up with needles in your hands and arms, the lighting is anything but soft and the atmosphere is less than homey. In a birth center, your room is very much like a bedroom. The bed is large and soft, usually with real sheets and fluffy pillows, the lighting is soft and low, music is playing if you want it to be, and your midwife is the only one poking and prodding you and it’s usually not very often. You are allowed to walk when you need to, eat when you need to, and labor in any position you need to. If you want to get in the shower, feel free. If you want to labor in the warm tub, sink in. The entire goal of a birth center is to make you feel as comfortable as if you were in your own home. One concern I hear often when discussing having a baby in a birth center is that the soon-to-be mom (and dad too) are worried that if something were to happen, they wouldn’t be at a hospital with doctors and equipment and medicine. I understand this concern as my husband and I, too, had it. Fortunately, most birth centers are very close to, if not already in, a hospital. For those birth centers that are not already in a hospital, a woman can be transferred to a hospital very quickly if she chooses to or if it is medically necessary. However, needing to be transferred to a hospital is a rare occurrence. According to the National Birth Center Study II, 84% of women who choose to have their baby in a birth center indeed had them there. Those women who did transfer from a birth center to a hospital did so for non-emergency reasons (such as prolonged labor). Less than 1% of the women in the study were transferred for emergency reasons. I personally have experience with a transfer from a birth center to a hospital. As I mentioned before, I labored for 40 hours at a birth center with my first baby. I had gotten stuck at 7cm and my baby was acynclitic (she was trying to come out with her head cocked to one side). Despite all of our best efforts to get her back in the right position, she, being stubborn like her mama, declined. After so many hours of no sleep, little to eat, and a LOT of physical exertion and pain on my part, I made the choice to be transferred to the hospital simply so that I could get an epidural in an effort to achieve my goal of having my baby vaginally. By the time we got to the hospital, my sweet, stubborn girl had shifted her position and I was at 9cm. A few hours later, she was indeed delivered vaginally and she was healthy, fat, and happy. It was not the birth scenario I wanted for her or I, but it was what I needed to do at the time and I am thankful that I was able to easily transfer to the hospital. The minutes and hours after a baby is born is a crucial time for mama and baby to begin to form their incredible bond. There are many things done in the hospital within those first crucial minutes that can interrupt that important bonding time as well as physically impact the health and well-being of the child. In my experience (and I’ve experience both settings), the postpartum experience in a birth center is light-years better than that of the hospital. In most hospitals (although many hospitals are moving toward being more baby friendly these days), in the minutes after a baby is born, he or she immediately has its umbilical cord clamped and cut, he/she is vigorously rubbed down with clean cloths and wrapped in a tight coil of blankets with his/her head covered in a knit hat. While this pretty common practice doesn’t seem so bad at first glance, there are a number of ways it either disrupts the mother-child bonding experience or potentially negatively impacts the optimal health of the baby. First, delayed cord clamping is fast becoming the recommended standard over the more traditional method of clamping and cutting right away. Delayed cord cutting offers a great many benefits to the baby, including higher birth weight, better early hemoglobin concentration, and increased iron reserves. While the general consensus among most professionals is to let the cord pulsate for one to three minutes post-delivery, many midwives subscribe to the rule of cutting the cord only after it has stopped pulsing entirely, which could take much longer than 3 minutes. Delaying the rub-down or the bath of a newly born baby is also a better for the health of the baby than an immediate clean up. The sticky white coating of vernix that covers a newborn is excellent at protecting newborn skin and helping it to adapt to the outside world. It also helps stop water loss through the skin, it aides in temperature regulation, and it helps boost the immunity of the child. Vernix continues to protect the new baby for as long as it stays on the skin. By rubbing the vernix off the baby’s skin as soon as he is born, the baby loses many of its incredible benefits. Delaying the cleaning and/or washing of the baby’s skin for as long as possible will do the child a world of good. Also, wrapping the baby tightly in blankets before handing baby to mom interrupts the very important act of “kangaroo care,” or skin-to-skin time. Kangaroo care is a method of holding a baby, naked or with only a diaper, against the bare chest of a parent, usually the mother, for an extended period of time. The benefits of kangaroo care to a baby include stabilized heart rate, stabilized breathing, improved oxygen saturation, more rapid weight gain, more restful periods of sleep and decreased crying, among other things. Done right after the birth, kangaroo care offers the added benefit of encouraging immediate breastfeeding. Finally, one benefit of using a birth center over a hospital that many people don’t think about is the postpartum support that the midwife offers to new mothers that an OB/GYN does not or cannot offer. After the birth of my first child, as I started experiencing symptoms of postpartum depression, I mentioned my symptoms to the doctor who delivered my daughter at my 6-week check up. He readily admitted to me that he was not as well educated or equipped to diagnose and treat postpartum depression and suggested I go to my general doctor or a psychiatrist for further diagnosis. As disappointed as I was to hear this, I appreciated his candor and I went to my midwife to ask for her advice. She was able to offer me the resources I needed to find a solution to my postpartum depression (we tried many natural methods that often work for many women, but in the end we agreed that I needed to see my general practitioner for a prescription for anti-depressants). My midwife was also able to offer invaluable insight and advice when I had issues breastfeeding and was able to connect me with an amazing lactation consultant who could further help me. While hospital birth is still the norm for women in the U.S., that does not always make it the best choice. Alternative options, such as home birth or birth centers, are steadily becoming more widely known and available choices. It is so important for moms and their significant others to research the pros and cons of each available option so that they may make an educated and informed decision. The birth of a baby is such an exciting, but also a stressful, time. Being comfortable in your decision on where to have your birth experience helps to take some of that stress away so that you can better enjoy the crazy, wonderful journey.